Who doesn’t love Champagne? 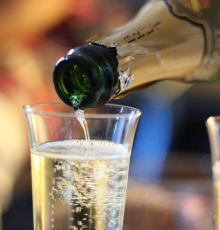 Any occasion instantly becomes a party whenever a nice bottle of bubbly is opened. The entire world simply adores this exclusive wine. And if you like it, too, but have no idea how Champagne is made, then this day is definitely something you don’t want to miss! Expat Club has traveled to the Champagne region in Northern France more than a dozen times since 2014. Today we visit the lovely house of De Castellane in the morning. And in the afternoon you have the opportunity to visit various smaller houses in the #1 Champagne village of Hautvillers. Later in the afternoon, we’ll spend time in the capital Reims with its impressive Basilique and its stunning Cathedral where the French Kings used to be crowned, and where you can see a unique stained glass window pane by Marc Chagall.